Whether it's your first or thirty first year of teaching, the giddy anticipation and excitement that a new school year brings is always palpable. Why? I like to think that it is because we are innately designed to seek out and thrive in new situations and adventures. We never like to stand still. Although a major text may never change over hundreds of years, the pupils that learn the piece continually do. Moreover, teachers are obviously good at teaching but they are equally as good at learning.We may have successfully taught Romeo & Juliet for the past ten years but every year brings its own demands and different obstacles to learning that must be overcome. In short, we are always willing to try new things. With that in mind, to start the new 2013/14 academic year I'd like to highlight three websites/apps that, I hope, any NQT or experienced teacher alike may find tickles their curiosity enough to use in the classroom this year. The short video below should give you a good idea of what Edmodo can do. Edmodo really is the first step you should take if you are curious to dip your toe into ICT use in the classroom and at home. I know lots of teachers are already using Edmodo but it is continually being updated with new features. Edmodo has just recently been optimized for use with the iPad if you are lucky enough to have whole school internet access. Edmodo is my number one pick because of its easy user interface and set up procedures. If you try nothing else this year, try Edmodo. The thing I like most about Quizlet is its simplicity. Many websites or apps can be nice to use once or twice but Quizlet can easily become embedded as a fundamental part of your teaching methodology. It can be used for learning, revision and testing. What I particularly liked about Quizlet, when using it last year, was the possibilities it had for paired or grouped learning. It is great for first, second or fifth year pupils that may be at least a year away from a state exam to digitally store their essay points, or revision notes, without the fear of the dreaded 'lost copy' or a canine encounter of a shredded kind! Triptico uses the tag line 'Inspiring Imaginative Teachers', and that's just what it does. 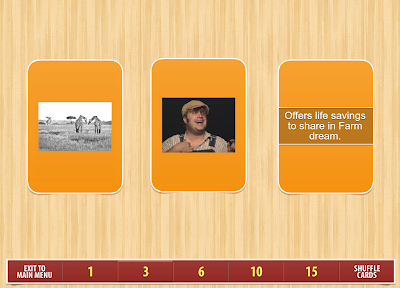 Triptico is a collection of web based apps that can be put on the projector in your room for a wide variety of tasks. The app is broadly broken into four sections; Tools, Timers, Selectors and Quizzes. Each section then contains various tools that you can personalize to your own topic/class specific needs.Any quizzes or tools that you create can be saved on Triptico's own cloud storage so you can create the task at home and have it waiting for you in the classroom the next day. Your imagination and curiosity will be your only barriers with Triptico.